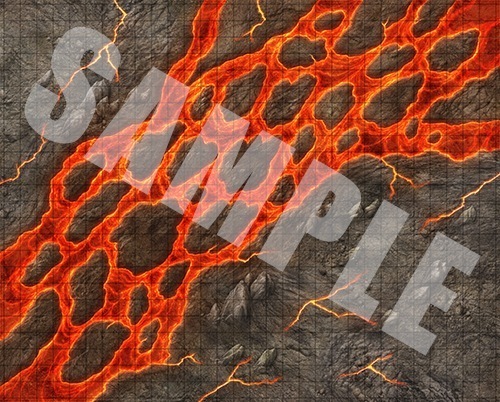 Whether your party is headed up the side of the forbidden volcano or down into Hell itself, no Game Master wants to slow the action down by drawing every lava flow and shattered boulder. Fortunately, with Paizo Publishing’s latest Pathfinder Flip-Mat, you don’t have to! This line of gaming maps provides ready-to-use and captivatingly detailed fantasy set pieces for the busy Game Master. This double-sided combat map features islands in a river of fire, volcanic hot spots, and even a shattered temple! Don’t waste your time sketching when you could be playing. 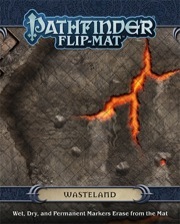 With Pathfinder Flip-Mat: Wasteland, you’ll always be ready when your players venture into the badlands or decide to challenge the volcano goddess on her own turf! The side with the ruined temple is from AP #74 or #75 i think. It can also be used for AP #95. This map is way too specific. Outside of the Abyss, Hell or Elemental Plane of Fire, it can only be used in so many scenarios. Brilliant Vic, I've been hoping to see some new terrain maps in the pipeline, especially generic planar-type terrain - its virtually non-existent out there. Look forward to this. This sounds cool. Definitely a buy. You know what I would LOVE to see is some type of great hall.. something like you would see the Vikings use. A good example would be the one in the Frostfur Captives Pathfinder Society scenario. Updated to final cover image, product description updated. Any idea when we'll see the sample images. Excited for this one. Don't want anyone to take this the wrong way I'm just trying to get a look into the design choices for the maps. I love this map set, the two features look great as always and I can see myself using it for a few different things. I also really appreciate the terrain style maps and hope we can get some more "planar" maps in the future - elemental maps, other hellscapes. However I have three questions: What is with the ruined building in the lower left corner? Seems so out of place. Why the decision to go with diagonal features? The lava river in this one, the bridge in the battlescapes and the water fall in the upcoming map. I don't think the lava river will be as painful, but generally a lot of diagonal counting and positioning is a pain. Is it purely an aesthetic choice? 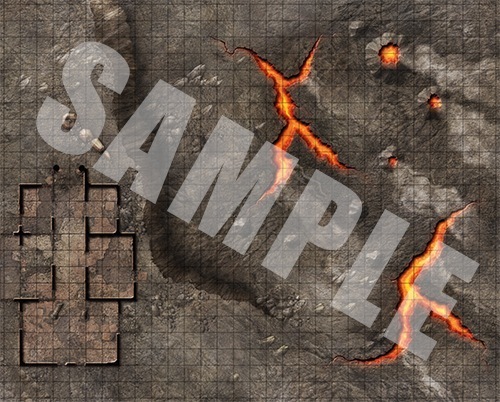 Lastly is this map compatible (similar colours, shades) with the hellscapes map pack released previously? Colours look fairly similar. Is there any possibility of a "generic rolling hilly terrain" flip-mat? You've given us plenty of grassy plains, forests and so forth, but I'm looking for something to represent the Kamelands in my Kingmaker game and it is astonishing how utterly nonexistent hill maps seem to be, either for purchase or even free on the net. Part of the reason for the non-existent lack of hill maps is that it is difficult to show elevation on a top down view point of a 3D map. While it is possible it is very difficult to do. Not to say it will not happen.. (I hope it does too) but I do not think it will go over really well though. Check out the newest addition to the line- rolling hills! Ask an dye shall receive apparently. It is partially an aesthetic choice. It is partially a way to get a larger bit of real estate on the map. It's partially something to make a more interesting in play and to make a markably different map than those done before (the bridge in Battlefields in particular). When I design these maps, I keep in mind the use of squares (I actually do a lot of thinking and re-sketching with those matters in mind) but I don't make everything snap to the horizontal and vertical grid. Too much of that and things get...well...boring. In both aesthetic and game play design. 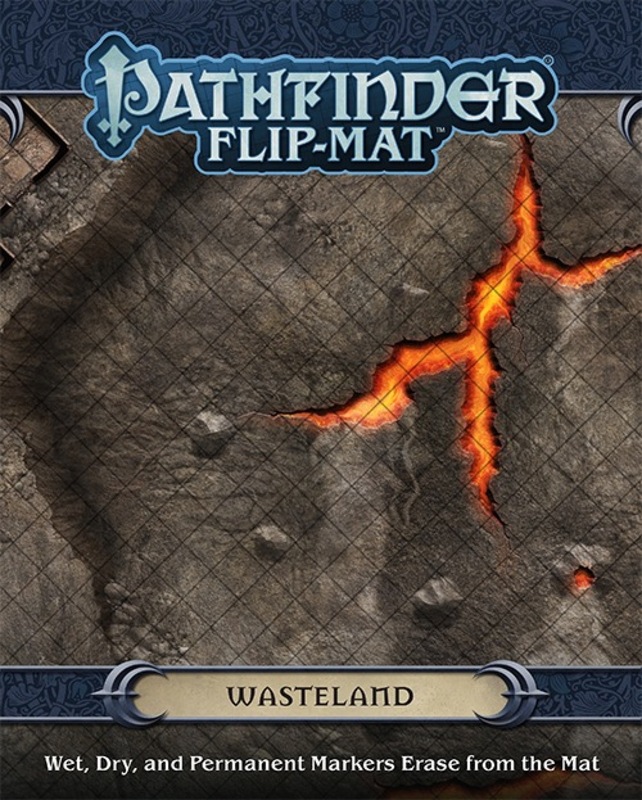 While the Flip-Mat: Wastelands map has similarity in colors and tone with Map Pack: Hellscapes, it was not designed to be full compatible with that product. Since the release of that product the lead designer of this project has changed and so has the artist. That said, I'm sure they will work well enough together. The newly announced Hill Country may scratch that itch. That said, the design is not entirely "generic." One side features a perilous highlands pass, but the other one has a hill lands that lead to a cave entrance that is compatible with the upcoming Map Pack: Cave Tunnels. I am curious as to whether Paizo would consider releasing the PDF versions of these maps with object layers that can be toggled. I understand that many players use the physical maps alone, but a growing number use digital versions -- printing out only the parts we need, or taking screen-caputures to re-assemble them, and using them in virtual tabletop applications. Consider: it would add quite a bit of value to this product if a purchaser could hide the lava layers, or replace it with a vegetation layer; that would be three maps that were different enough to represent many different adventure scenarios. Surely, when these kinds of maps are created, artists use layering features of graphics applications. Does anybody else think that the fissure on the cover image looks suspiciously like the crack in the universe from Doctor Who?